What Causes Green Eye in Animal Photographs? What Causes Green Eye in Animal Pictures? Your precious kitten's eyes always appear to glow green in pictures. The family dog can't get his picture taken without bright white eyes showing up in the photo. Why is that? It's caused by a light phenomenon called 'green eye' and it's the same anomaly that causes red eye in humans. Green eye is a common problem in animal photography when a flash is used but it's easy to avoid if you know what causes it. Green eye occurs when light enters the eye of an animal at the same level as the eye. If your pet looks up at your camera when the flash goes off, the light from the flash can reflect from the back of their retina and this can cause a colored glow over their pupils. When light reflects off an object it does so in a sort of "V" shape (an angle equal and opposite to its entry). 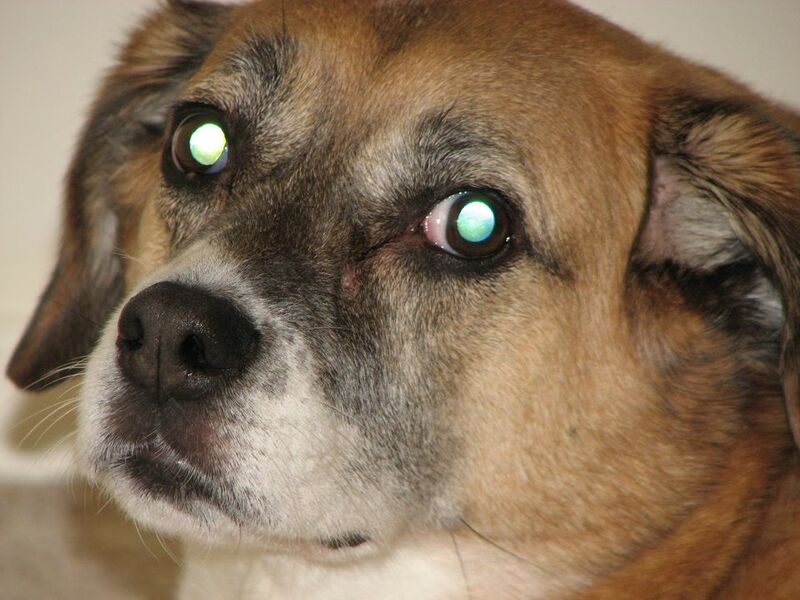 If your pet is looking directly at the camera and the flash is at the same level as their eye, the light enters their eye and is directed right back to the camera, causing the glow. Quite often, this happens when the pupil of an eye is dilated such as in a dark room or when outside at night. The animal's pupil is naturally larger so they can see better at night and this also allows more reflected light to enter and exit the eye. Human eyes reflect red because the light is hitting the retina's blood vessels. The eyes of animals, on the other hand, reflect green, blue, white, or yellow light because of their night vision. Many animals have a membrane called the tapetum lucidum in their eyes. In animals that have this membrane, the light is blocked from striking the blood-rich retina that would show up as red-eye. Different light spectrums are reflected from this membrane based on its chemical makeup and it can vary from one animal to the next. Blue-eyed cats do not have the same membrane in their eyes so they actually show red eye instead. Using a built-in camera flash. The lens and flash on most cameras are close to each other and this increases the chances for green eye. The pupils that are dilated. At night and in dark rooms, an animal's pupils can be quite large and this increases the amount of light that can be reflected back to the camera. The camera lens is level with the eye. If you're on the same level as your dog, the chances of getting green eye increase. The same is true if your pet looks up at the camera at the right angle. It's easy to prevent green eye and this same advice can be used for red-eye when photographing people. Direct your pet's eyes slightly away from the camera. Just slightly to the left or right will be enough, so use your free hand to grab their attention. It will still look as if they're looking into the camera, but the light won't reflect directly into the camera. Use a flash with a tilt head. Bounce it off the ceiling or a wall to get nice indirect light on the subject. Use a diffuser on your flash. Soften the light of your flash with a white, semi-transparent material such as tissue or wax paper. Change your angle. Take the photo from a slightly higher or lower position than your subject's eyes. The photo will be a little more interesting as well.